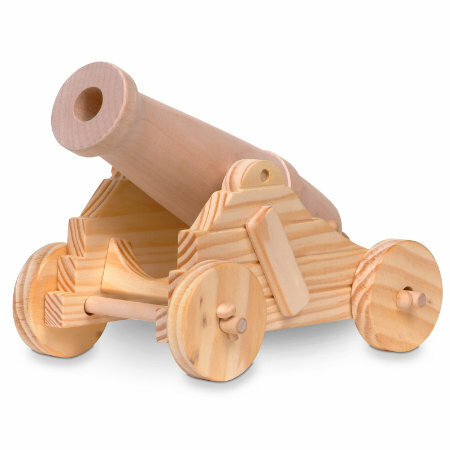 The wooden firing cannon is a lovely toy for encouraging children to follow instructions and create their own play piece. We really liked how the instructions were pictorial, making it accessible to children regardless of their reading ability. It also promoted problem solving and strategy skills when things didnt quite work as they should! However, there were also parts which were a bit fiddly and children needed some adult help. This is a great product for fostering a sense of pride in their own achievements, and our testers particularly enjoyed using their creative skills to personalise their cannon with paint and felt tipped pens. Once competed, our testers were delighted that the cannon actually fired. We really liked how once completed, the children could use the cannon in their imaginative play, developing their storytelling ability. Who can knock over the most targets with this adjustable trajectory cannon craft kit? Not only really great fun but excellent for hand to eye co-ordination. Comes with some cut-out cardboard targets to get you started, tissue paper to make the cannon balls and solid wood parts to make the cannon. Glue not included.